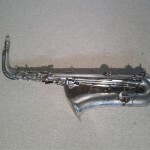 This is a very playable old sax from the 1920’s, which comes in handy if you don’t want to bother with transposing on sight. Serial number 798XX, which puts its date of manufacture in 1921. Straight neck, split bell keys, rolled tome holes. 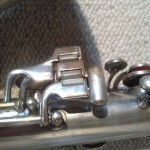 I’ve never found a proper C-melody mouthpiece that I like, they’re all too closed, but this horn plays well with an open tenor mouth piece like a Berg or a Link, and then you get a much more modern sound, without intonation being too much of an issue, it needs some adjusting but it’s not too bad. With a bit of work it can be played perfectly in tune. 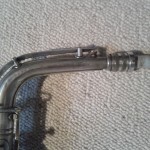 Alto pieces can also work well, but not all of them work. 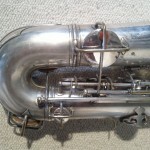 I’ve got a metal Berg that plays really well on the c-mel for a killer, well-projecting sound, a bit rounder than your typical alto, but more cutting than a tenor. 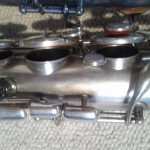 As far as I’m concerned these are very underrated littele gems, they sound great with the right mouthpiece, and the craftmanship is fantastic, a lot of the modern horns cannot come close to it when build quality and complexity of sound is concerned. The ergonomics may take some getting used to, but that’s not a big thing, and when you’ve gotten used to it these play as nice and fast as anything. 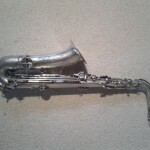 This entry was posted in C-Melody and tagged c-melody, conn, mouthpiece, saxophone, wonder by admin. Bookmark the permalink.